Visitor numbers were up compared to the March Flea Market. 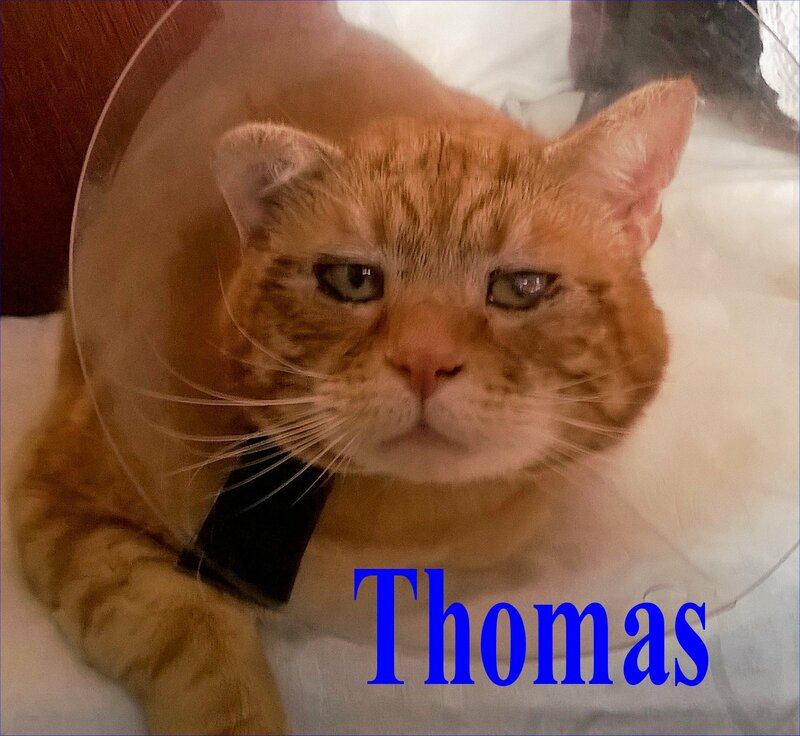 We managed to raise a very welcome £1,115 to enable us to continue rescuing and re-homing stray and injured cats and kittens. Many thanks to everyone who donated items for our stalls. We had some nice prizes for the Tombola which did well, special thanks to Jane for her donation of lots of chocolates with which she had gone to a lot of trouble to create attractively gift wrapped packs of goodies. Also thanks to Barbara & Glynis for their knitted chicks with chocolate eggs and Easter baskets. The kitchen did well and again Dawn baked her wonderful cakes and with contributions from Salma & Tom. Thanks to everyone who helped in the kitchen, unlike the rest of us that can take the weight off our feet now and again the kitchen crew are busy and on their feet all day from 7.am until 2.30 pm. They then have to clean up to leave the kitchen tidy, it’s a long day and we appreciate their help. Thanks also to our many helpers on the stalls and in the foyer who haven’t had a specific mention, we couldn’t do it without you. A big “thank you!” to you all. We are always looking for volunteers to help on the day, can you spare a couple of hours? We have a very friendly group of volunteers but could always use a few more helping hands. Could you bake some cakes for us? Give us a call on 01772 750263 (preferably after 6pm any evening) if you would like to help in any way. Needless to say we have now run out of good quality prizes for the Tombola and will need to collect many more prizes for our next Flea Market (Sunday 5th May). So please keep the donations coming. If you have any items to donate, please Tel Christine on 01772 750263 or Sylvia on 01772 716837. We had a Great day at the Preston & Blackpool Cat Club Show on Saturday 23rd March, we raised £271.00 by selling catty things donated by you! (Our wonderful supporters) a fantastic amount. Needless to say our stocks of Feline themed items are now very much reduced, we would like to do another cat show in August subject to having enough good quality catty items for sale. If you would like to donate items for us to sell then please call Christine on 01772 750263, if no one answers please leave a message someone will back to you. This lady has been living rough in Queenscourt Avenue off Kingsfold Drive in Penwortham, Preston for the past four weeks. A kind couple have been feeding & sheltering her, she is quite timid and is a good weight. Hopefully someone is missing her, please share on FB and get her home. 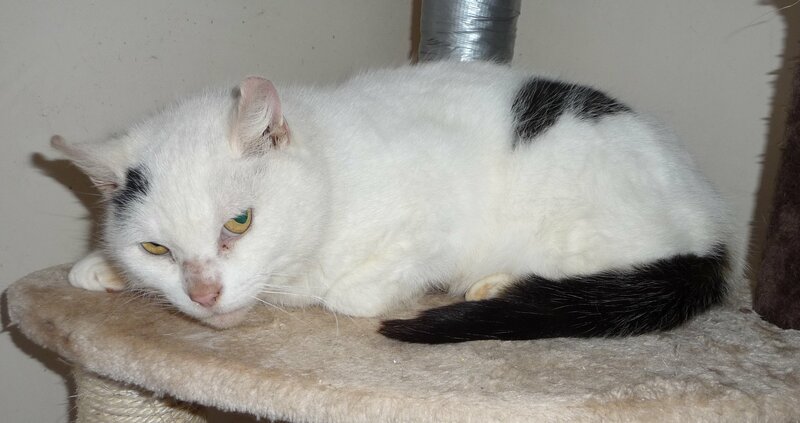 Call us on 01772 750263 if this is your cat. Posted in General | Comments Off on Is this your cat? 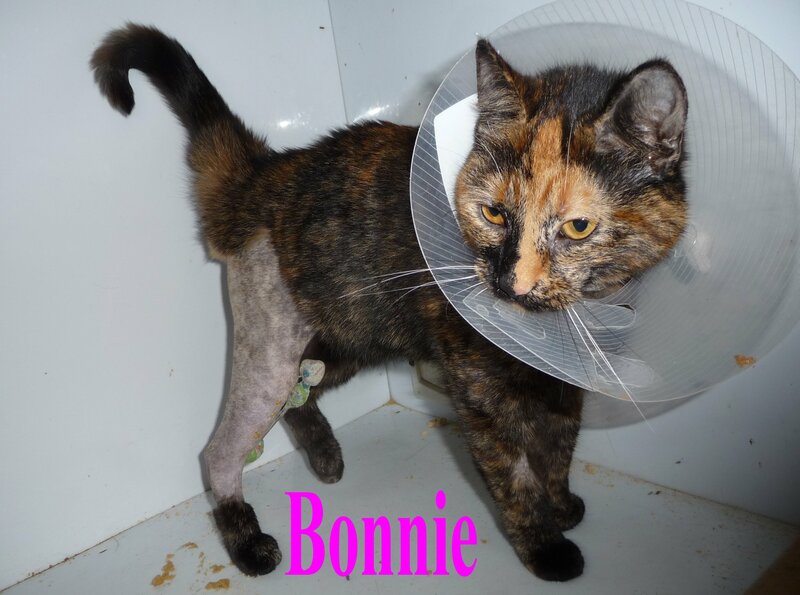 This is Bonnie, she was found under the bonnet of a scrap car at Recycling Lives, Longridge. She had a damaged leg and what looked like a burn mark on her jaw. She was taken to Oakhill Veterinary Center on Conway Drive, Fulwood, we were contacted and we agreed to fund her treatment. 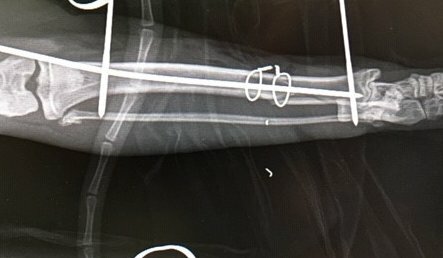 Xrays revealed that her leg was broken. 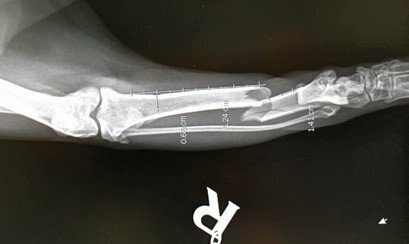 Her leg was pinned and an external frame fitted to stabilize the repair. She is now with us at the rescue, we will have to keep her immobilized (cage rest) for about six weeks. Then (if no owner comes forward) she will be put up for adoption. 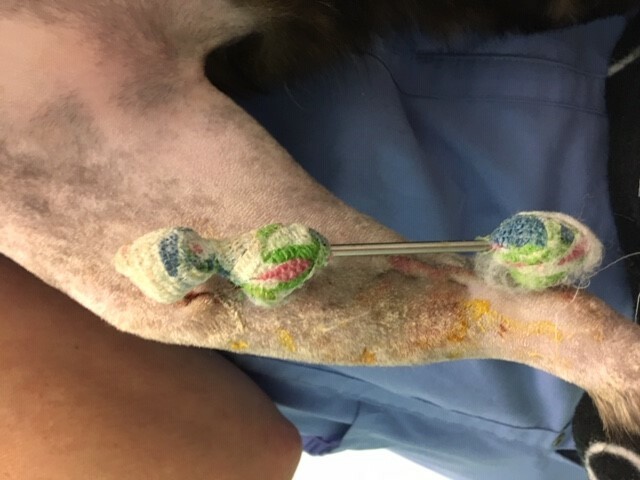 If you would like to help Lancashire Cat Rescue to fund her treatment please CLICK HERE and make a donation. We have a collecting box in the “Lazy Cat Cafe” in Cannon Street, Preston City Centre. The other day some lowlifes stole it, have a look at the video, do you know these women? Please call Greater Manchester Police on 01618 565 629 if you have any information that could help bring these people to justice.